Ultra-Compact & Lightweight, 1 lb. 14 oz. Total. High Strength Hard Anodized 7075 Aluminum Frame. 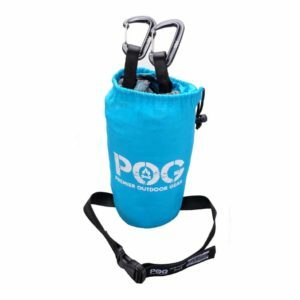 Non-Sink Feet, Rip Stop Drawstring Nylon Carrying Bag. POG 100% Satisfaction Guarantee – If You Don’t Love It, Return It. The POG lightweight camping chair offers the best materials for durability, quick setup and comfort. 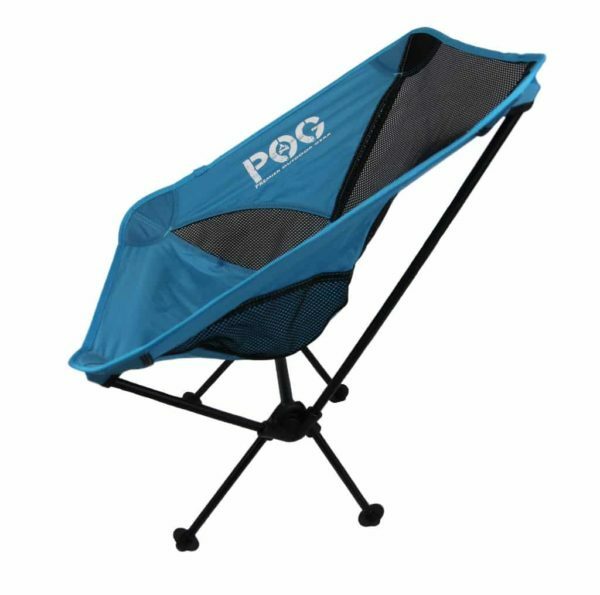 This lightweight chair will give you a comfortable place to sit at the end of a long hike without breaking your back or your wallet! This chair is great!This chair is great! This is my first time investing in a chair that is designed for backpacking. I’ve always carried around those huge chairs that can’t even fit in a pack. Honestly, I never knew how much I would use a chair until I had this one available to me on the trail. No more sitting on tree stumps! It’s extremely easy to put together, and as light as a feather. The best part is that I no longer sink into the ground when I sit in the chair since it has the non-sink feet! I would recommend it! After going through countless chairs, I stumbled upon this one, and the reason I decided to purchase it was for the non sink feet. I will mainly be using it at my beach house, so I needed a chair that wouldn’t sink into the sand while I was fishing from the shore, or just out relaxing. This chair held up perfectly and I couldn’t be happier. It didn’t sink into the sand whatsoever. I ended up getting another to put in my kayak, but I ended up just using it for camping trips. I wasn’t really worried about the weight since I don’t do any hiking, but I have to mention, it’s really light. Best backpacking purchase I've madeThis chair is identical to the chair zero. My friend was mad to know that I paid $36 for Springer camping chair while he paid over $100 for Helinox chair zero. It fit my backpack, light and packs so small. I love this thing, it’s perfect for anyone who loves to backpack. Its not only light but also comfy. Assembling it is a breeze, probably takes me under a minute now to do it. I haven’t tried it at the beach yet, but it seems to work very well on soft dirt, in terms of not sinking into the ground. Like some other people have said, it is a little difficult to stretch the first time, but it’s really not that bad. The materials seem extremely durable and rugged, so I’m not worried at all of this thing ever breaking. Plus it comes with a one year warrant and 100% satisfaction guaranteed which is nice. At first, I was a little skeptical of the quality of this product, but once I received it and took put it together, I have been nothing but impressed. The chair is extremely well made, and the materials used are very high quality. It also comes with legs that don’t sink into the ground! 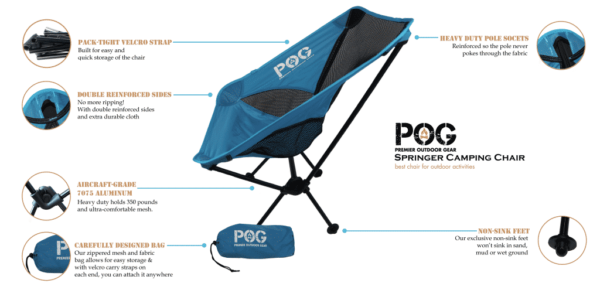 If you are looking for a portable light chair, you won’t be disappointed with the Springer. I 100% purchase this chair again. Hope this helps everyone. This chair has saved my back countless times. Being a lightweight backpacker, I’m always searching for the lightest gear, that is also extremely high quality. Finally, I’ve had the opportunity to sit comfortably in the woods, without spending an upwards of 150$ for a chair. It’s a very quick assembly/disassembly, all you have to do is pop the poles into their sockets. The chair is high enough, so you aren’t pushed into a fetal position with your knees touching your head. You can also lean back without it breaking or rolling back. The feet also come in handy when you are in any terrain that doesn’t have a solid ground. This chair is about as good as it gets. I’m 280lbs, and there aren’t many lightweight chair that are designed to support my weight. If you have ever tried to use one of the chairs in the past, most of the time the poles in the flex and end up tearing the fabric. But this one has held up extremely well, with minimal flexing. Not only have I used this chair at a few campouts with my son’s boyscout troup. But I also use it on cookouts and other events my wife and I have gone to. Every situation I have used this chair, it has provided nothing but comfort. I’m very pleased with this product. I have a lot of joint problems, so standing for long periods of time tend to be an issue. Luckily I can carry this chair around everywhere. I can’t wait to purchase a few more for my wife and kids when Christmas rolls around. This chair is great! I gave it four stars because I had some difficulty stretching the fabric over the poles the first time I used it. It makes sense that it would be tight, and over time would loosen up a little, but still it was difficult for me and I had to get my husband to do it. Other than that It’s a great little chair! The chair is surprisingly comfortable. I wasn’t sure if it would be because the chair didn’t seem to have as high of a back as other camping chairs on the market. But it’s depth made up for it, and it has saved my lower back. Overall the set up was a breeze. Most of the poles actually popped into place by themselves. It took me a second to figure out which way to put the fabric on, so it took me around 3 minutes to put it together. And taking it apart was a little faster. I love how the chair comes apart and the poles can be compacted into a small bag, that is easy to carry, and doesn’t take up much space in a pack. I bought this chair to take to some music festivals over the summer, and it has been great. It weighs less than 2 pounds and I barely even notice when I’m carrying it. The frame comes together in like 10 seconds and the feet it came with were perfect for all the mud at the festivals, but also worked just fine on the dry spots too! I wanted to stand a lot at the festivals too so I wanted something lightweight that I wouldn’t mind carrying. About 10,000 people asked me where I got it. I love this chair! 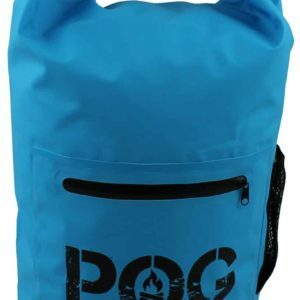 Packaging: The packaging is very compact, and makes it great for squeezing it into tight backpacks, also the drawstring can be tied to the outside of a pack which is great. Assembly: Assembly was quick and easy. Just pop the frame together and pull the fabric over. Rounded feet are a great addition as well. Disassembly: Just as easy as the assembly, packing it back into the bag didn’t prove to be a problem like some of the other chairs I’ve had in the past. Quality: The material of the chair seems to be great. I only weight 180lbs so I wasn’t really worried about anything since it said it could hold up to 300lbs. Overall a great chair to add to my camping gear. I do a lot of kayaking and needed a small chair to use when I decided to take breaks on the shore. This is by far the best chair I have ever boughten. I’ve had it about a month, and I use it all the time. I got it mainly for kayaking but have started using it in a lot more places than I expected. It doesn’t take up any space at all and is really light. It’s also comfortable. Great chair, I’m 290 lbs so I knew I was pushing it since the limit was 300, but its held up great. After you stretch the fabric a little the setup becomes easy. I take this thing in my canoe for fishing, and also have taken it to a few concerts. 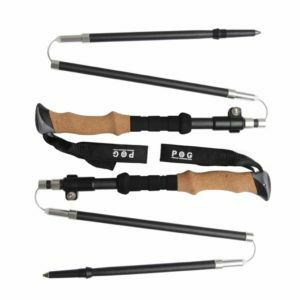 I purchased this product because I love to go camping and hiking, but I have limited space. This chair is amazing. It condenses down into an extremely small bag, but it is also comfortable to a full grown adult when fully put together. Being a soccer mom I also now take it to all the games, now I have room for more soccer gear in my car! This chair is everything it was described to be, light, comfortable, compact, and none sinking. The only problem I have with it is putting it together. The cloth fabric for the seating is extremely hard to stretch over the aluminum frame. It loosened up after a while, but the first few times was a real struggle. It wouldn’t be a good product for older people. 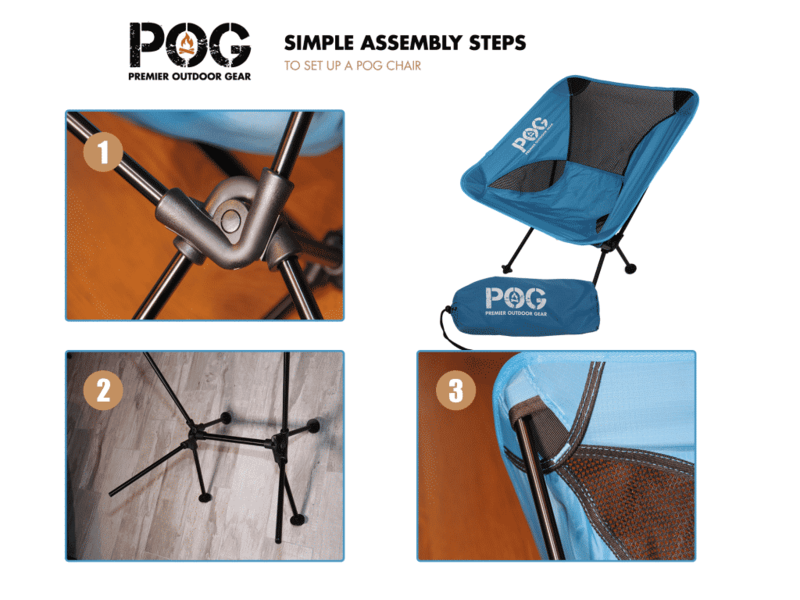 If you’ve ever tried out a collapsible camping chair, you probably already know how this one works. It has great balance, and is comfortable and lightweight. The one difference that this one has that others don’t is the non sinking feet. This innovation is great and I never realized I needed it until I had this one. So many times I used to sit in my old chair and always ended up have to pull it out of the ground when I was done, which in turn ended up getting dirt/mud on a lot of my gear. I just thought that was part of having a chair. With this one however I feel like I’m living in luxury, no more having to pull my chair out of the ground. This thing is so light! I could hold it up with one finger. I don’t really understand what kind of magic they use for something so light to be able to support me (250lbs) but hey, I’m no engineer. Overall, I am extremely satisfied with this chair, and my son also loves taking it on campouts. I’m in love with this chair. Pretty much everyone I’m around always sits in it when I get up to do anything, adults and kids. It’s super cozy. The great thing about it, is that it’s low enough to the ground that you can stretch your legs fully out, but it’s also high enough so you aren’t bent over to wear your lower back will start to hurt. I’ve had back pain my whole life, and I have yet to get any uncomfort from this chair, even after sitting in it for a few hours, which is truly a blessing. Anyone with back pain knows how I feel. This chair is quite lightweight. The only complaint I’ve ever had about it is that it doesn’t have any cup holders in it. Of course, this isn’t a necessity, but it would make the design a little better. It’s a convenience thing. Other than that, it’s a super small bag and extremely light. If anyone is on the edge of paying for it or not, trust me you won’t be disappointed! Great chair just wanted to write a little review to help others that buy it. Make sure that when you buy it, go ahead and take it out and assemble it at your house. Leave it assembled overnight. This will allow the fabric to stretch out, so when you are in a rush later, either camping or hiking, it will be much easier to put together. The mesh back on this chair is so helpful. Nothing worse than sweating all over a chair after a long hike. This thing breathes like crazy. It’s nice feeling a breeze on your back while sitting in it. It seems like every aspect of this chair is the highest quality that it could possibly. 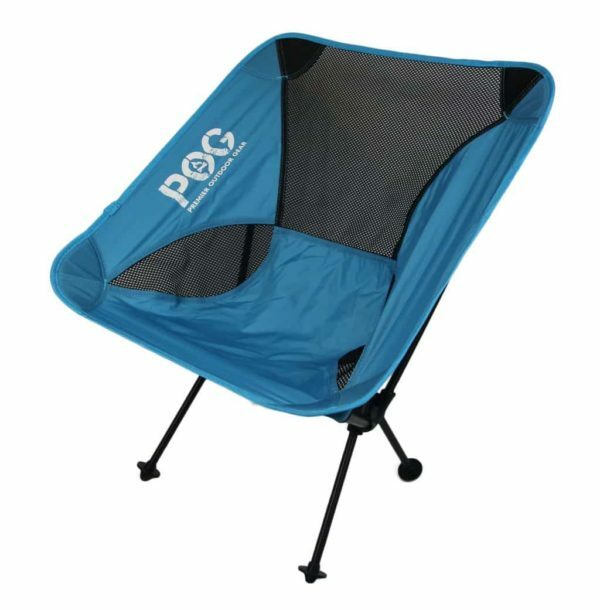 The fabric is very sturdy, and the aluminum frame barely flexes when I sit in it. It compacts down to a pretty reasonable size, and is pretty light. The drawstring bag is a nice addition, I normally just tie it to the side of my bag using a carabiner. Very pleased with this purchase. Got this chair so I could have one on my motorcycle whenever I went camping or went to any event that required a chair. I had been carrying around one of those huge chairs you have to sling over your shoulder and I had finally had enough. This chair is just as comfortable as those other big chairs and holds me just fine. The only complaint that I have is that I didn’t find this website sooner. Took this on a trip up to Canada, and was so happy with it. Light, and packs up nicely. It sits pretty high for this type of chair, so I had plenty of room to extend out my legs. I envy everyone else who looks at me while they sit on logs lol. The Springer Camping Chair is working out great for me even though I don’t hike much. I got the gray color one and it straight up works for what I use it for. It breaths nicely on my back in the scalding heat when I’m tailgating with the boys. I wanted something I could just throw in my day pack with some cold ones and travel around easily. It is compact, so I can fit more of the essentials in my bag too. I’m a bit of a heavier guy, but the chair hasn’t broken or anything like that even though it is on the small side and is ultra lightweight. Even though it’s small it’s comfortable enough. Only thing I have a problem with is that it doesn’t have a cup holder. It would be perfect for me then. This chair is built very well! It is everything I was looking for in a hiking and camping chair. It’s lightweight, easily compactable, and doesn’t break the bank. I was surprised that it works so well since I did not know the brand very well. Some of the other chairs I have purchased from other places have been cheaply made or not worth what I spent for them at all. 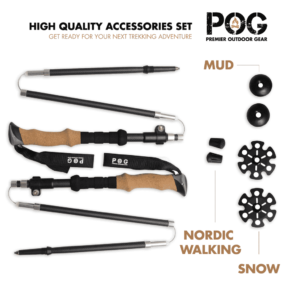 However, I am happy to say that Premier Outdoor Gear has delivered a product that I will be holding on to. I have only had mine for a short time, but I have put it through the wringer and it hasn’t broken yet. Great value and I will definitely buy from these guys again. Used this chair at Shaky Knees in Atlanta. The chair is a dream when it comes to carrying it around a festival and that is mainly why I bought it. It’s a long walk from parking to the stages and even the stages themselves can be far apart from one another. The setup time is nothing and the chairs sit low to the ground. Overall, a great choice and worth the price. Packaging: The stuff sack is great. Has a draw string design and all parts of the chair fit snugly inside of it. Assembly: Each leg of the aluminum frame is connected by a bungee cord that makes sure all the parts stay together. Seat backing attaches on very quickly easily and is taught. Quality: Seat backing is very durable and the frame appears to be well made. Good quality. Disassembly: As easy to take down as it is to put up. Chair fits compactly into the bag. Very light footprint design. 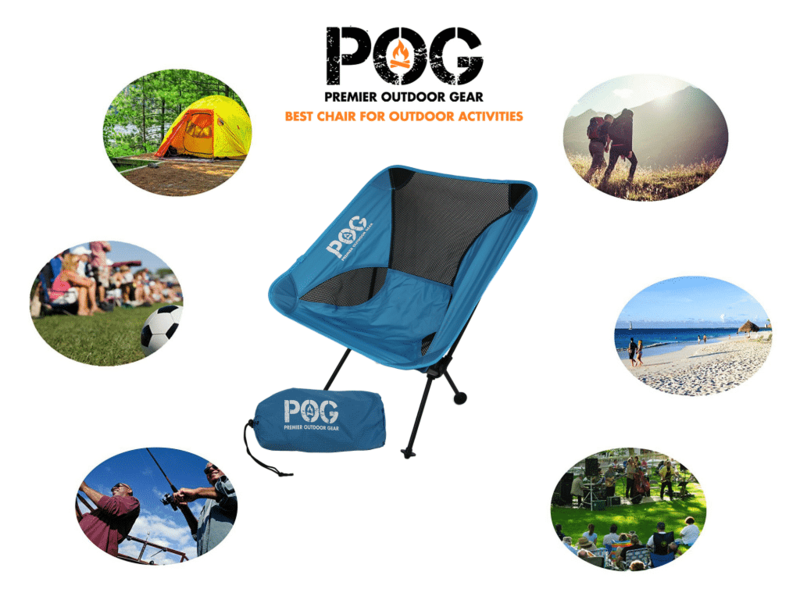 It’s a lightweight camping chair and it rocks. It does exactly what it is supposed to do. Really great chair, I am about 270 pounds and use it about every other week. It sets up well and sometimes I heat up the fabric in the sun so that it stretches out and is easier to set up. I am happy with the comfortability of the chair. I take it out on my fishing trips and sometimes use it in my yard. I purchased this chair a few months ago and recently used it in Nassau on the beach. We travel around a lot and usually purchase chairs when we arrive at our destination since they are often cheap and unwieldy to travel with. This chair is lite weight though so we decided to take it with us in our luggage and it worked out really well. It supported the abuse we put it through for our two week vacation with no problems. I think it could last for years and was a better solution then our original plan of buying chairs every year. Very pleased with this purchase. I have a cooler that I like to prop my feet on during my kids soccer games and I thought this chair would be too close to the ground for me to do that. It isn’t. It took me a bit to get the hang of setting it up just cause I couldn’t get the frame into the backing, but I figured it out eventually. The chair doesn’t make my back sweaty when I sit in it which is a miracle cause those soccer fields can be hot. Good price. Superb chair! If you are on the heavier side or have issues standing up then this chair may take a minute to get used to as it is low to the ground. It is super light and easily transportable. I use it for backpacking since I’m trying to get in better shape and I am glad to have something to sit on that isn’t a rock or tree at the end of the day. It is a good quality chair and nothing was frayed or bent when I received it. Very easy to toss in a bag and just go. My child had to go on a mandatory school camping trip and I wanted him to have a chair to sit on while he was in the woods. This chair was reasonably priced and advertised the features that I was looking for: lightweight, small, high quality, and reasonably priced. I only expect to get one use out of it since our family doesn’t go outdoors much, but my child said that it was a lifesaver on his trip since the ground was wet from rain. He said that he wasn’t miserable since he didn’t have to sit on the ground. He was one of the only kids to have one! I am thankful I bought this chair for him. I bought a couple of these chairs for my family a couple of months ago and they have worked spectacularly! Perfect for going to watch the kids play their sports since they are easy to transport around. Not only are they lightweight but they are comfortable to boot! We have gotten a lot of value out of them even though we don’t do a lot of hiking or camping. They are very convenient! I THINK THIS CHAIR IS GOOD! THE SIZE OF THE CHAIR MAKES IT SEEM LIKE IT WOULD BE WEAK. DO NOT BE FOOLED BY YOUR EYES AS IT IS VERY STRONG. I LIKE THIS CHAIR SO MUCH SINCE IT IS EVERYTHING I EVER HOPED AND DREAMED IT WOULD BE. LIGHTWEIGHT, COMFORTABLE, AND STRONG. This chair is so cool. I was able to assemble it in under a minute. I only recently got it so I will have to see how durable it is, but it is very well designed and looks cool. It is extremely light and I can fit it into the side of my backpack when its broken down. I am taking it with me on my trip to Colorado in a couple of weeks as my friends all have a chair like this as well. Sometimes a man just wants a camping chair that isn’t terrible for a good price. 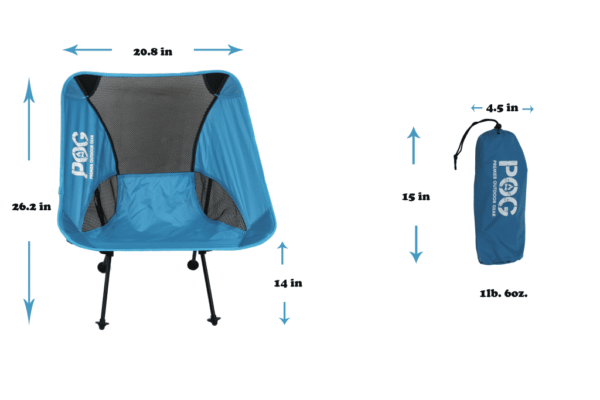 I can say that this Springer Camping Chair is a chair that is precisely not terrible and is a good price. Does it ship quickly? Yes. Does it come with the gizmos of other chairs out there? Yes. Does it support my weight when I sit in it? Yes. Is it light? Oh yes. Will it do your dishes? Maybe one day. Does it work? Absolutely. I will be adding this to my collection of camping chairs that I use. I bought this to replace my older (larger) camp chairs that I used to carry. Is comfortable, looks sleek and well made, and doesn’t sink into the ground. Pretty easy to assemble in my garage, which I did to stretch out the material to make even easier to assemble. They sit low to the ground so word of warning if your knees are not great. I am a busy college student who likes to go camping and hiking on the weekends whenever possible. I have limited space in my dorm room which means I look for things that don’t take up a lot of my valuable space. This chair is great to use not only as a camping chair but also as furniture in my dorm room. I must move dorms every year and my life is not very stable so having chairs that are light and are multi-functional is a great thing. They are also able to support a lot of weight for my friends who are on the heavier side. This is one of the best purchases I could have made for college life. Honestly, I am thankful I can pack them down so easily if I have to go somewhere fast. I bought this chair for waiting in line at the stores in NY for promotions and grand openings. It is one of the best investments I have made and has saved me so much standing time. It fits easily in my bag, is light, and I do not have to sacrifice a lot of space to bring it around the city with me. Premier Outdoor Gear sent everything they were supposed to when they shipped it and it came very quickly to my building. It is also inconspicuous, and I have gotten a lot of complements on how smart an item it is to have. I have also not broken it which is surprising as I have not been kind to it, so I suppose it is tough. I bought this for my fiancé because I already had one similar to it. I received it at our home very quickly and was a little disappointed initially. I almost sent it back as it was smaller than the one I have. However, we were getting ready to go on vacation to Miami and he insisted that we bring it with us. My fiancé is fairly large but he was pleased with this chair and it didn’t sink into the sand at all. It folds very well and I thought he would need a bigger chair since he is a bigger man, but he liked how easy it was to carry and said it worked great for him. I have no issues with the quality and my husband wants me to get one too. I like the one I have already but could see myself getting another one of these if mine breaks. I love this chair quite a lot. 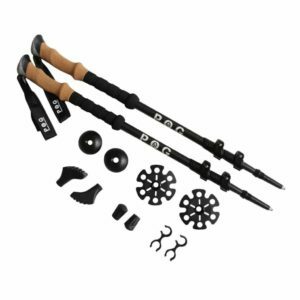 It is great for hiking and backpacking. It packs away very tightly, is comfortable, and is a pleasure to assemble. The quality of the chair seems to be high – it feels good. I haven’t used the chair on the beach yet, but it works great on solid surfaces. The fabric does take a little effort to stretch onto the frame, but is not too difficult at all. Wonderful to use for day hikes and in the backyard. The chair is low to the ground and very light so you will get wet and it will be swept away if you place it in even a light stream. I bought this chair as a gift for my son who likes hiking as his previous chair had snapped at one of the legs. I looked around the web and a lot of the other options available were more expensive than I wanted to spend. For what I expected, the chair exceeds my and my sons expectations. The chair assembles easily. Sometimes the chairs need to be broken in for the mesh backing to easily fit into the leg frame, but we were able to easily attach everything together hassle free from the start. It is also super lightweight but is sturdy and well made. It also doesn’t sink into the dirt or mud very easily like some of the old chairs did. This was a good buy for me and my son says he loves it. If I had a dollar for every time I have had a lightweight camping chair break on me I would have two dollars. That’s right, I’ve been through two similar chairs in the last three months, so needless to say I want a chair that is durable. When I bought these I mainly looked at the price since they are cheaper than other chairs with similar claims. I did this because I spent more on the other chairs and they broke, so I don’t want to spend a lot on something that might break. I’ve had this chair for awhile now and it hasn’t shown any sign of giving out on me yet. I am surprised that the value has been so good and it seems like a decent chair. I had to replace all my folding camp chairs because no one want to bring the bigger ones anywhere anymore as they are annoying and inefficient. These chairs are exactly what I needed in order to update my chairs since they are much more compact and space efficient than the old ones. They are also very easy to put together than the old ones as these smaller chairs are all connected to one frame. I have used these chairs for backpacking and lounging. They are great and now people want to use them again! Let me start of by first mentioning that if you have children you should probably go ahead and order more that one. It doesn’t matter where I bring this thing, my kids are always sitting in it. I wasn’t sure if the quality was high enough since in around 260lbs, and I had tested a few similar models at REI and couldn’t find one that was comfortable to my bigger frame. I just couldn’t understand how a chair that weighed less than 2 lbs would be able to withstand my weight. Even though it said it could hold up to 300lbs, I was still a little skeptical. I decided to go ahead and buy it since it was marked down so much. I received the product about a week later and it came in it’s own drawstring bag. After taking it out of the package it took me about 2 minutes to assemble the whole thing and about another two minutes to put it back in the bag. Everywhere I have taken I’ve been asked where I got it, and I’ve let countless people sit in it to test it out. It’s held my weight and is comfortable. The only thing I try not to do is lean back to far just so I don’t put to much stress on the back legs. The materials used are top of the line. I now have two of them, and keep one in my car at all times. Solid chair with a good design. The fabric feels good on my back and it sits nicely on the ground. Just as good if not better than any of the other chairs I have used in my life. This chair is well made and comfortable, but if you are a super broad shouldered guy like me at 6’6 and 270lbs then it might not fit your shoulder width very well. I would recommend this as a great ultra-lightweight backpacking camping chair if you are a regular person. Hopefully they will make something like this for us bigger guys. I was hesitant to buy this chair initially because I was unfamiliar with the brand and wanted high quality. The company has a satisfaction guarantee so I decided there wasn’t much to lose besides some of my time if it turned out to be a dud. When I assembled the chair for the first time my fears vanished into thin air as everything was in order. The chair is very light and durable. When I sit back into the chair it does a good job of distributing my weight. It is very easy to set up and has an interesting fiber look to it. Overall, a very nice and functional camping chair at a great price. I’ve been looking for a light compact chair for a few weeks now. I took a trip to REI and tried out all the chairs they had to offer in their hiking section and couldn’t find one that was both lightweight and comfortable. I stumbled upon this website, and after reading the description decided to give this chair a try. I just took a trip to New Mexico and used the chair every day. Not only is it lightweight, and comfortable, but also held up extremely well. When hiking with a ton in your pack, every pound counts. This chair is great! This is my first time investing in a chair that is designed for backpacking. I’ve always carried around those huge chairs that can’t even fit in a pack. Honestly, I never knew how much I would use a chair until I had this one available to me on the trail. No more sitting on tree stumps! It’s extremely easy to put together, and as light as a feather. The best part is that I no longer sink into the ground when I sit in the chair since it has the non-sink feet! I would recommend it! At first, I was a little skeptical of the quality of this product, but once I received it and took put it together, I have been nothing but impressed. The chair is extremely well made, and the materials used are very high quality. It also comes with legs that don’t sink into the ground! If you are looking for a portable light chair, you won’t be disappointed with the Springer. I would 100% purchase this chair again. Hope this helps everyone. The chair isn’t bad at all. It’s comfortable, but not REALLY comfortable. I used it on the 4th of July and it did the trick, I just wouldn’t consider it a luxury chair. Super lightweight though.